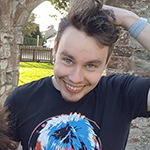 Lee Cheatley, after graduating in 2015 from the University of Aberdeen with an MA (Hons) in Archaeology and History, obtained his MSc in Information Technology from the University of Aberdeen in 2016. During his studies he worked on archaeological excavations within Scotland, and was part of the team (and at times scrum master) that developed a web application intended to help school children determine which University and College courses they were able to pursue, and which were best suited to them, and their personality. Since then, in October 2016, he has begun his PhD at the University of Dundee. Working cross-departmentally between DJCAD and the School of Science and Engineering, to explore how technology can be used to facilitate the mourning process that follows the ending of a relationship.